Coburn’s observations foreground several issues that are at the heart of Cecilia Björkén-Nyberg’s The Player Piano and the Edwardian Novel (2015): the quandary faced by those unable, or who have never had the opportunity to learn, to play the piano, but who deeply appreciate and wish to perform the music written for it (and, via piano reductions, for the orchestra); the tension between admiring music ‘naturally’ and respecting it professionally; and the anxieties generated by a mechanically made art, be it through technology or through the prestidigitation of a well-trained human being. For Coburn, the pianola – invented by Edwin Votey in 1895, and launched on the market in 1897 – resolved these contradictions by initiating a newly ‘democratis[ed]’ (p. 2) kind of music-making. To wit, the ability to reproduce without professional skill musical compositions by manipulating a machine, one which allows its operators to influence the tempo and expression of music stored in rolls (whose perforations map the information from which a pneumatic mechanism creates a seemingly virtuoso performance). Björkén-Nyberg’s book, a study of such ‘virtuoso machine[s]’ (p. 2) in human and mechanical form, charts the long history and phenomenology of these contraptions. Her account stresses the material, historical, and social factors that determined the need for ‘devices for producing music mechanically’ (p. 1), connecting those elements, in an unexpected move, with representations of pianism, musical reception, player pianos, and automaticity in the Edwardian novel. Here that means such well-known tales as Max Beerbohm’s Zuleika Dobson (1911), E. M. Forster’s A Room with a View (1908), Howards End (1910), and Maurice (written 1913-14), Compton Mackenzie’s Sinister Street (1913-14), and Dorothy Richardson’s Pointed Roofs (1915), along with less obvious texts, including E. F. Benson’s The Challoners (1904), Henry Handel Richardson’s Maurice Guest (1908), and M. E. Francis’s Christian Thal (1902). Tracing intriguing connections between the novel and player pianos – such as the link between the covers of novels and decorated piano rolls carrying the name of the recording pianist – Björkén-Nyberg develops a distinctive methodology. Indeed, The Player Piano and the Edwardian Novel is a book as much about the instrument as about the literature. In this respect it invites readers to think more carefully about the porous boundaries between ostensibly different kinds of early twentieth-century experience: on the one hand a mechanical, yet creative, device that allowed its users to consume a huge variety of canonical classical music; and on the other, documents – novels, musical treatises, reviews, concert guides, periodical contributions, and musicological polemics among them – in which that creativity was explored. The first chapter, ‘Storing Music in Edwardian Fiction’, establishes the terms with which we might measure literature’s role in recording ‘musical behaviour’ and ‘the experience of music’ (p. 15) it enables. Björkén-Nyberg claims that Edwardian music novels transcribed pianistic data; they registered intellectual and sensory information associated with player-piano performance and thereby contributed to an increasingly complex field of media discourse at the turn of the twentieth century. Her second chapter, ‘The Engineer’, focuses on connections between metaphorical mechanism (humans as machine) and the new definitions of pianism afforded by the player piano’s mechanical potential. Exploring distinctions between mechanical perfection and virtuoso skill, in manufacturing documentation as well as in literary works, Björkén-Nyberg argues that the Edwardian novel chronicles the increasing impact of mechanism upon human selves, especially with regard to the fatigue experienced by pianists as they strive to acquire their technique (A Room with a View is an important reference point here). The third chapter, ‘The Performer’, considers the virtuoso ‘condition’ in relation to what Björkén-Nyberg calls ‘the mechanical shadow’ (p. 105) from which advanced levels of performance are inseparable, and with which more intimate, domestic music making can conflict. The fourth and final chapter, ‘The Composer’, addresses the problem of whether literary structures can evoke sonata form, particularly in the case of the Bildungsroman, and sets that question in relation to a player piano discourse that stretches to include turn-of-the-century debates about the New Woman, among many other emphases. As this selective summary of Björkén-Nyberg’s main contentions suggests, there is a lot going on in this book, which combines literary analysis, cultural history, archival research, musicology, musico-literary theory, and sociology into a sometimes uneven whole. Indeed, at times the book’s argument is harder to follow than perhaps it needs to be, not because of any significant fault in the prose style but rather due to Björkén-Nyberg’s often associational methods of reasoning. 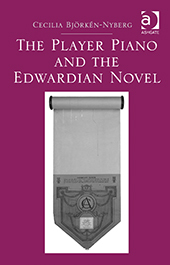 Although the claims of The Player Piano and the Edwardian Novel are consistently rooted in an impressively researched and carefully historicised body of evidence, that approach zigzags through contexts and source materials with such speed that at times the broader thread of the argument can be difficult to detect. One page, for instance, cites the virtuoso guitarist Yngwie Malmsteen alongside Liszt and Thalberg, thereby signalling the long history of technical ‘mania’ that follows musicians of a certain dazzling calibre. Such a strategy allows Björkén-Nyberg continually to forge interesting links between time periods and to establish lines of significance between disparate phenomena (e.g. her discussion of William Stanley Jevons’s Logical Machine as a route into Benson’s The Challoners, pp. 52-7), but sometimes at the cost of rhetorical clarity and often at the expense of structural literary analysis. Put another way, as a piece of cultural history The Player Piano and the Edwardian Novel is continually intriguing and often fascinating, but it does not in my view do sufficient justice to its selected cast of Edwardian novels as novels (as distinctly literary artefacts, that is, as opposed to discursive or medial ‘storage’ devices). The book consequently reads as a persistent shifting between two kinds of study, cultural-historical and literary-critical, never quite settling on either. Yet the gains made by employing such a method are multiple. I learned a huge amount reading this book and as a result firmly recommend it to literary scholars working on musico-literary subject matters. Musicologists will learn from it, too, not least because the book shows how responsive to medial developments turn-of-the-century literature – not all of it canonical – really was. And even if Björkén-Nyberg’s readings of certain texts (especially A Room with a View) sometimes stretch credulity, nevertheless the readings are consistently thought-provoking, raising key questions about the intersections between cultural forms at a time of unprecedented medial blending. One of the core tasks she sets herself – to show that ‘without the excessive consumption of music that the player piano facilitated through its storage potential, there would not only have been less music performed but also a smaller quantity of literary text produced and stored in novels’ (p. 38) – is accomplished amply, and often with a compelling sense of the shaping links between industry, journalism, and culture. The very distinctiveness of Björkén-Nyberg’s approach leaves The Player Piano and the Edwardian Novel open to different sorts of polemical challenge, but as an interdisciplinary intervention it is one of the most noteworthy critical books, and certainly the most original musico-literary study, that I’ve read in recent years. Alvin Langdon Coburn, ‘The Pianola as a Means of Personal Expression’, The Sackbut, 1.2 (June 1920): 57-9, at 57. This entry was posted in Reviews and tagged E. M. Forster, edwardian literature, edwardian music, max beerbohm, music in edwardian fiction, musical history, player piano. Bookmark the permalink.